The Fight of the Century (five years late?) 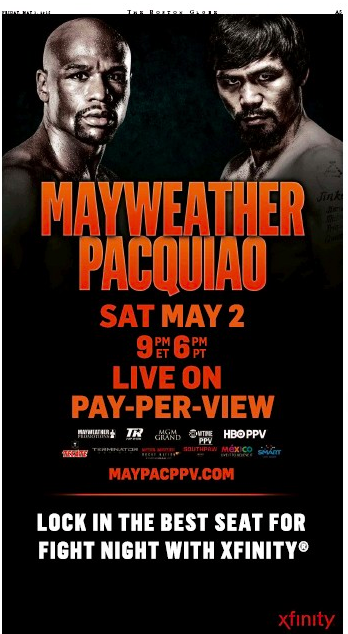 is on tonight, with Floyd Mayweather Jr. facing off against Manny Pacquiao in the squared circle at the MGM Grand Garden Arena in Las Vegas. As for the Fight of the Century advertising, the Boston Globe seems to have won the early rounds of that tilt between the local dailies. No such ad ran in Friday’s Boston Herald. In terms of news coverage, yesterday’s fighty local tabloid did feature this Ron Borges piece. While the stately local broadsheet ran this Callum Borchers Page One take on the fight. The hardfighting staff looks forward to both of today’s bakeoffs. But we’re only paying for one.